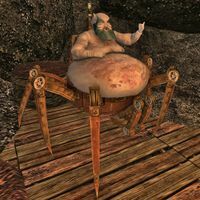 Yagrum Bagarn is the last known living Dwemer. He is sick and bloated from the effects of Corprus disease, and under the care of Divayth Fyr, the ancient Telvanni wizard residing in Tel Fyr. You may meet him in the main quest when you must collect the Dwemer Boots of Flying for Divayth Fyr. Or, you will meet him for answers during the quest Mystery of the Dwarves. Before the Disappearance of the Dwarves, Bagarn was a Master Crafter in the service of the chief Tonal Architect, Lord Kagrenac. His opinion on the use of the Heart of Lorkhan is unknown. If you consult him about the Disappearance of the Dwarves, he will present you with a few theories, and will be able to enlighten you further if you bring him the books Divine Metaphysics... and The Egg of Time. "You're here for the Dwemer boots. Tell my gracious Keeper that I have done what I could. Only a Dwemer magecrafter could have done so much. But only idiots could have created these boots. It shames my race that we must be judged by the works of such lack-wit blunderers." "I have Lord Fyr's Dwemer boots. That's what you're here for, aren't you?" "So. It's you again. What brings you to visit Yagrum Bagarn, Master Crafter, and Last Living Dwarf?" "Do not harm me, or you will be very sorry. I warn you. Leave me alone, and I will leave you alone." "I have nothing. Go away. Leave me in peace." "I have nothing. Go away. Leave me in peace... but... wait. What is that you have there? Is that what I think it is? That unique dwemer artifact you have?" "If you have really brought me Kagrenac's Planbook and Kagrenac's Journals, I can at least try to restore the mythopoeic enchantments on Wraithguard." "I have learned all I can from Kagrenac's Planbook and Kagrenac's Journals. Now, if you're still willing, I'll try to restore the mythopoeic enchantments on Wraithguard." "I see you have equipped Wraithguard. I wish you luck with it." bleak existence: "Since the disappearance of the Dwarves, I have been alone in this world, trapped in this grim prison. I can scarcely move. And my fellow inmates are scarcely good company. The risk of corprus disease deters most visitors. But if you meet with cultivated minds undaunted by the terrors of the Corprusarium, you might mention your recent interview with the Last Living Dwarf." Disappearance of the Dwarves: "Hmm.... I cannot say what happened. I was not there to observe. I was in an Outer Realm at the time, and when I came back, my people were gone. I left Red Mountain, wandering Tamriel for years, searching our deserted colonies, looking for a survivor or an explanation. Then, a long, long time ago, I returned to Red Mountain, still looking for answers. Instead, I found corprus disease, and I have been here ever since. I have theories, if you are interested." Divine Metaphysics: "This book is just an explanation of some of Kagrenac's theories. I could spend hours explaining them to you, but Kagrenac is dead, and I believe his theories must die with him." [Dwemer Boots of Flying has been added to your inventory.] "Lord Fyr obtained these enchanted Dwemer boots from an unfortunate thief. And, given the quality of their craftsmanship, little wonder the fellow came a bad end. But I can do nothing for them. The fundamental enchantment is flawed. Might as well start over again... if such a pair of boots could still be fashioned in these benighted latter days. But I have done my best. Take them to Lord Fyr, with my sincere apologies." "I gave you the boots. Didn't I?" "I had not seen this book before, but it reinforces some my own theories. If you were to find more books like this, bring them to me and perhaps I could tell you more." [Providing you have Divine Metaphysics.] "By refreshing my memory with "Divine Metaphysics," I believe I can explain. The Dwemer were not unified in their thinking. Kagrenac and his tonal architects, among them Bthuand Mzahnch, believed they could improve the Dwemer race. Others argued that the attempt would be too great a risk. The war with Nerevar and the Dunmer may have led Kagrenac to carry out his experiments prematurely. Although this book argues that nothing disastrous could result, the disappearance of my race argues otherwise."
gracious keeper: "I owe my life to Lord Fyr. He took me in when I was a mad monster, out of my mind. In time, I emerged from my dementia, and now I am quite lucid most of the time, though my body is still a grotesque and useless prison. And I still have some feeble hope of cure. Lord Fyr has tried many spells and potions. None have helped me, but neither have they harmed me. If anyone can cure this disease, Lord Fyr can." Hanging Gardens: "Yes, this book is written in both Aldmeris and in Dwemer. Many books were written in both languages in the days of Resdayn when Dunmer and Dwemer ruled together peacefully. I'd offer to translate, but this is really just a boring travel guide. If you find any other books in Dwemer, I could translate them for you." Kagrenac's Journals: "Kagrenac recorded every step in his manufacture and testing of enchanted items. His journals will record any modifications or enhancements made to his original designs. I don't know where his journals might be. I am fairly sure they haven't been discovered, or Divayth Fyr would have heard, and would have told me. That suggests they remain to be discovered in some Dwemer ruin here on Vvardenfell." Kagrenac's Planbook: "Kagrenac carefully planned all his projects in advance. His planbook will have all his original designs. I don't know where the planbook might be. I am fairly sure it hasn't been discovered, or Divayth Fyr would have heard, and would have told me. That suggests it remains to be discovered in some Dwemer ruin here on Vvardenfell." Last Living Dwarf: "This is how I style myself. I do not know for a fact that I am the last. But in my travels thousands of years ago. I never encountered another. And since I have been here, I often ask Lord Fyr, but he says he has never heard a credible rumor of another Dwemer, on Tamriel, or in any Outer Realm." my race: "Once I was a Master Crafter in the service of Lord Kagrenac, chief architect of the great Second Empire freeholds, and the greatest enchanter of his time. I could not match the genius of Lord Kagrenac, but what he could envision, I and my colleagues could build. All of that is gone forever. I still retain my cunning, but my hands and eyes fail me, and my memories have long faded. My only consolation is each day to mock the gods who destroyed my race, and condemned me to this bleak existence." "I'm not sure I can explain. In his search for the secrets of immortality, Kagrenac sought to control supernatural forces that you might call 'divine'. This artifact -- called 'Wraithguard -- was one of the tools that he created for this purpose. Some believed his tampering with such forces was profane, and terribly dangerous. You know the Dwemer disappeared? His use of these tools may have been responsible." Sounds dangerous to me. Thank you. "It probably isn't very dangerous. You couldn't have known, but you took a great risk handling it." I don't think this artifact is working. Can you restore the artifact? "I'm not sure. Let me see. [Examines the artifact.] No. I don't think so. Not without Kagrenac's Planbook and Kagrenac's Journals. But, if the originals still exist, and I could study them, then, yes, perhaps I could restore the artifact. Whether I should or would, on the other hand, that is a different matter." Offer payment or service. "This is not a matter of personal gain. This is a matter of right and wrong, and the risk of potential harm... and the question of your motivations and character." Plead on the basis of my reputation. "I'm sorry. Your reputation is not so great that I would risk putting such a powerful device in your hands without a very compelling reason." Show him 'Vivec's Plan' and 'Dagoth Ur's Plans'. "[Reads 'Vivec's Plan' and 'Dagoth Ur's Plans'.] I see. Dagoth Ur's use of the enchantments on the Heart of Lorkhan presents a great danger. And you need this artifact -- Wraithguard -- to destroy those enchantments, and Dagoth Ur. This is a good cause. If you can find Kagrenac's Planbook and Kagrenac's Journals and bring them to me, I will do my best to restore Wraithguard to its proper functions." "You must find Kagrenac's Planbook and Kagrenac's Journals and bring them to me before I can attempt to restore the mythopoeic enchantments on Wraithguard." "Good! Very good! You have found Kagrenac's Planbook! Now you must also find Kagrenac's Journals and bring them to me before I can attempt to restore the mythopoeic enchantments on Wraithguard." "Good! Very good! You have found Kagrenac's Journals! Now you must also find Kagrenac's Planbook and bring them to me before I can attempt to restore the mythopoeic enchantments on Wraithguard." "You've found Kagrenac's Journals and Kagrenac's Planbook! Good. I'll take them and study them. It shouldn't take long. Give me a day, then come back, and I think I can restore Wraithguard's mythopoeic enchantments." "Even if you were in perfect health, and if you fortified your health as much as possible, there is a good chance that you would be killed the first time you equipped Wraithguard. I would not risk it in your condition." tales of your exploits: "A remarkable story. A pity to have to destroy Kagrenac's enchantments on the Heart. It would have been interesting to study them." theories: "Lord Kagrenac, the foremost arcane philosopher and magecrafter of my era, devised tools to shape mythopoeic forces, intending to transcend the limits of Dwemer mortality. However, in reviewing his formulae, some logicians argued that side effects were unpredictable, and errors might be catastrophic. I think Kagrenac might have succeeded in granting our race eternal life, with unforeseen consequences -- such as wholesale displacement to an Outer Realm. Or he may have erred, and utterly destroyed our race." unique dwemer artifact: "Do you know what this is? This is Wraithguard, an enchanted device created ages ago by my former master, High Craftlord Kagrenac, a long-dead Dwemer mage-smith. I believe it is one of the tools he created to forge mythopoeic enchantments. I was one of Lord Kagrenac's Master Crafters, and though I didn't work on this project, I knew of it from my fellow mage-smiths." Yagrum Bagarn is technically a creature, not an NPC. Thus, he can be soultrapped, and responds to spells that affect creatures (Calm, Frenzy, Demoralize, Rally), not people. In the game data, there are three audio logs which are attributed to Yagrum Bagarn that he does not use. One is alarm dialogue: "Nooo!" Another is a greeting: "A visitor! What brings you to visit Yagrum Bagarn, Master Crafter, and Last Living Dwarf?" The other is a remark about mathematical constant surfaces: "Now... if I could just figure a scheme of classifying manifolds for TRI-PLY-connected surfaces... or even MORE complex surfaces..."
It should be noted that Yagrum Bargarn is essential to the Main Quest, for both 'ordinary' and back-path characters. If he is killed at any time prior to his restoration of Wraithguard, it will be impossible to defeat Dagoth Ur normally. For further info, please see the relevant quest and artifact pages. Killing Yagrum Bagarn will turn Divayth Fyr hostile permanently. Yagrum also appears in Legends. This page was last modified on 13 October 2018, at 05:58.